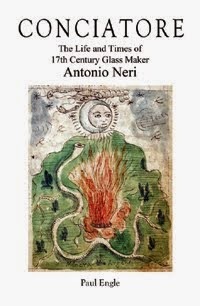 Shortly after ordination as a priest in the Catholic Church, Antonio Neri wrote a manuscript devoted to alchemy, which he called Treasure of the World (1598-1600). It was completed a couple of years before we find any reference to his glassmaking activities. Among the recipes, is one for the philosopher's stone, entitled "Fifth way to make the stone which is very secret." Neri explains that "Friar Mauritio" was a Dominican brother, held prisoner in "The Castle of Naples" by Gilbert Montpensier. There he learned the secret of transmuting mercury into gold. Ultimately, he was freed from his French captors and went on to use his secret to create great wealth. The recipe was passed down through his family, and ultimately fell into Neri's hands. He presents the full recipe, which takes many pages in the manuscript detailing complex alchemical manipulations. Some background is in order here. In the year 1494, French King Charles VIII amassed a very large army (twenty-five thousand men), and with encouragement from the duke of Milan, marched straight down the Italian peninsula with the intention of annexing the Spanish controlled Kingdom of Naples, which encompassed the entire lower portion of Italy. But by the time Charles marched into the capital city, his victory was already threatened; a "League" was forming to oppose him among the states of northern Italy. Charles set up an occupation government, quickly appointed Gilbert Montpensier as viceroy and judiciously headed back toward France, but not before having to fight through the League forces blocking his way. The city of Naples would be held by the French for only three months; the occupation government barely in control. Truth be told, it was not only Friar Mauritio who was confined, but the entire French contingent was more or less sequestered to several fortresses in the area, as they were greatly resented and resisted by the Neapolitan people. Soon the Spanish military was on the scene and systematically routed French forces, reclaiming all of the lost territory. The most likely location of Mauritio's imprisonment was the foreboding Castel Nuovo, but there are other possibilities, among them Castel Sant'Elmo and Castel dell' Ovo. In the same years that Neri was writing about the Dominican Friar Mauritio's imprisonment, Dominican friar Tommaso Campanella was held and tortured in Naples, under suspicion of heresy and conspiracy against the Spanish rule of his native Calabria. His "heretical" views on astrology and departure from sanctioned Aristotelian doctrine earned him a cell at Castel Sant'Elmo. The ancient Castle dell' Ovo or "castle of the egg," is located along the bay of Naples. The name derives from a story about the Roman poet Virgil, who at one time was thought to be a great sorcerer. Supposedly, he had fortified the foundations of the castle with a magic "egg," which he concealed there. Legend warns that if the egg ever were to be disturbed or broken, the entire Castle would self-destruct, and a series of great calamities would befall the city. The endeavor of history rightly demands strong attention to demonstrable facts. Unfortunately, folklore is often a casualty of that process, because, by its very nature it has little to contribute that can be vigorously verified. 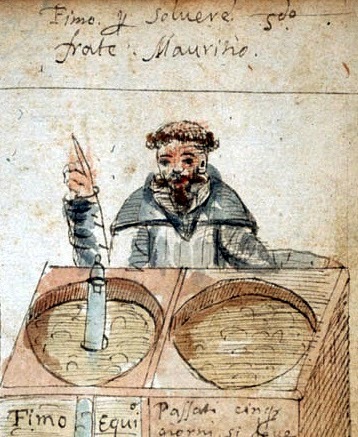 The identity of Neri’s Friar Mauritio and, for that matter, the existence of Virgil's egg in the foundations of a Naples castle, in all likelihood, will never be confirmed. But these stories have qualities that solid evidence often does not capture. Regardless of its factual content, folklore tells us about the hopes and fears of the people who repeat it; it is a taste of their culture. Folklore also emphasizes that the way we see history is very different from the way contemporaries saw it. We have no choice but to view events of the past through a lens of the present, just as Neri viewed it through the lens of his time. His view of the events was very much colored by legends about characters like Virgil and Friar Mauritio, but also by the promise of transmutation, and fear of the Inquisition. * This post first appeared here on 12 March 2014.